The new Silver Class and Gold Class Memberships include a range of benefits, including the "FCT" benefits. To ensure that Members with an active First Class Ticket aren't "paying twice" for the same benefit, we've provided each of you with a choice of discount codes - one for monthly memberships, and one for annual memberships. If you have an active First Class Ticket as at Nov 8, 2018, you have already been issued with a Monthly Discount and a One-off Discount. You must apply either of your two Discount Codes before they expire on Dec 31, 2018. This is your last chance to get this discount offer. Of course your membership discount will continue running after this date (if applicable). Your Monthly Discount saves you $2 for each month remaining on your currently active ticket. 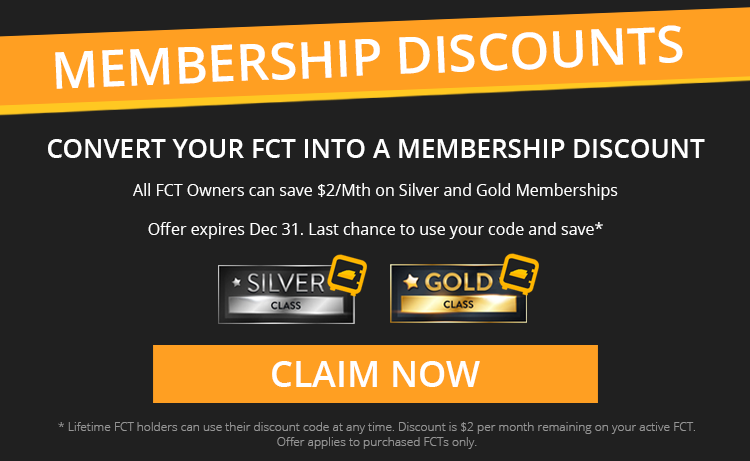 If your FCT expires in December 2018, you have a discount of $2 per month for 2 months, or you can save $4 off the Annual Membership. If your FCT expires in August 2018, you have a discount of $2 per month for 10 months, or you can save $20 off the Annual Membership. Paste the code into the box, then complete the Checkout. WHAT ABOUT LIFETIME FCT OWNERS? Your discount never expires. You can choose to save $2/mth or $24/yr forever. If you cancel your membership, your Lifetime FCT still remains active. If you already have a membership and have not used your discount code, please contact helpdesk at store@trainzportal.com. DO I LOSE MY EXISTING FCT? No. Your existing FCT will operate exactly as it does now whether you have subscribed or not (or whether you have used your discount code or not). e.g. If you have 7 months left on your current FCT, and you use your discount for one month, then cancel, you still have 6 months left on your existing FCT. WHICH MEMBERSHIP OPTIONS CAN I SELECT? Your discount applies to either Silver Class or Gold Class. Find out more about the membership options here. WHERE CAN I GET MORE INFORMATION ABOUT TRS19? Please visit our TRS19 information page here. WHERE CAN I FIND THE TRS19 FAQS? Please visit our FAQ site here. Just click the image below to find your discount code. If you require further assistance, please contact helpdesk at support.trainzportal.com.